It is estimated that to read a newspaper, one must learn about 3,000 characters. College graduates know about 6-7,000, and there are very few people who manage to learn over 15,000. Nevertheless, the actual number of characters is much larger. The Shuowen jiezi, the first surviving Chinese dictionary complied by Xu Shen around 100 AD contains over 9,000 characters, the Kangxi zidian or Kangxi Dictionary from the 18th century has nearly 47,000. The largest modern dictionaries have over 60,000. How do they alphabetize files? What do they kids sing in pre-school to learn all the characters? How can a whole sentence be formed with only 2 characters? How can you spell out peoples’ names if there are no letters? Or I guess if it’s a whole new character, how would you know how to say their name out loud if it’s a character you have never seen before? I have so many more random questions. 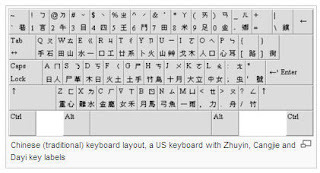 Also, please find the two keyboards I found that represent a Chinese keyboard. One that has all the characters and one that has English letters with only a few characters? Which of these do they use? The first one terrifies me. Can you imagine having that thing in your cubicle? Ok. Random thought for the day, over. Thanks in advance to anyone that has any answers to my questions! So there are actually two ways to type in Chinese. 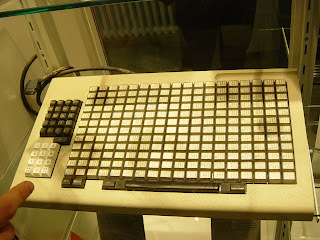 One uses a keyboard like that where you kind of assemble each character from the strokes that make it up. You start adding two together and it really narrows down how many are left. (This is also how Chinese dictionaries are organized.) The other is typing the phonetic sounds that the characters would make, called "Pinyin" (Translation Tool). Like when you type "tushuguan" (library), it will automatically know which characters you mean.